Mid-Back Task Chair With No Arms Offers Style, Durability And Exceptional Value Without Compromising Comfort. To Adjust This Ergonomic Chair To Just The Position You Need, Functions Include Pneumatic Seat-Height Adjustment From 18-9/10" To 24", Articulating Seat And Back, And Curved Height-Adjustable Ratchet Back And Tilt Lock. Seat-Angle Adjustment Will Lock In Any Position From Front To Back. Forward Seat Tilt Changes The Angle Of Your Thighs To The Floor For Full Back Support When Working At A Computer. Back And Seat Are Upholstered In Fabric And Feature 2-1/2" Thick Cushions. Nylon Five-Star Base Is Equipped With Smooth-Rolling Casters For Easy Mobility. Weight Capacity Is 275 Lb. Seat Measures 20" Wide X 17" Deep. Back Size Is 17" Wide X 18" High..
Mid-Back Task Chair With No Arms Offers Style, Durability And Exceptional Value Without Compromising Comfort. 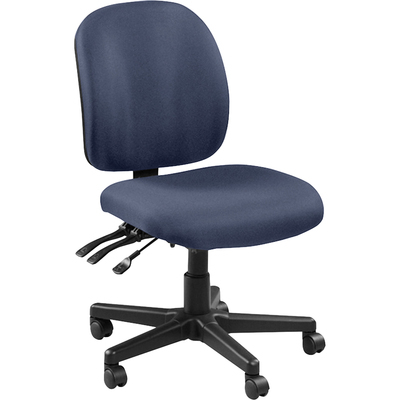 To Adjust This Ergonomic Chair To Just The Position You Need, Functions Include Pneumatic Seat-Height Adjustment From 18-9/10" To 24", Articulating Seat And Back, And Curved Height-Adjustable Ratchet Back And Tilt Lock. Seat-Angle Adjustment Will Lock In Any Position From Front To Back. Forward Seat Tilt Changes The Angle Of Your Thighs To The Floor For Full Back Support When Working At A Computer. Back And Seat Are Upholstered In Fabric And Feature 2-1/2" Thick Cushions. Nylon Five-Star Base Is Equipped With Smooth-Rolling Casters For Easy Mobility. Weight Capacity Is 275 Lb. Seat Measures 20" Wide X 17" Deep. Back Size Is 17" Wide X 18" High.